The Amazing Incredible Shrinkage of Ehud Olmert……. – The Tundra Tabloids……. 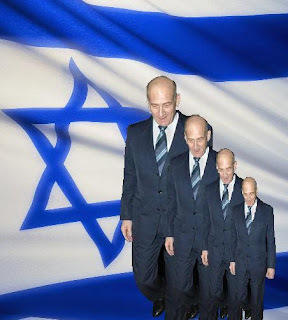 The Amazing Incredible Shrinkage of Ehud Olmert……. Even in the last minutes of his time in office, Ehud Olmert is determined to prove to the Israeli public, that he is actually just a shell of the man that he pretended to be. The man is as delusional as the Left, who are right now applauding his words (conversion) while condeming his “taking so long to mouth them”. It’s politicians like Ehud Olmert and Tzipi Livni that breath hope into the corpse of Palestinian nationhood from the sea to the Jordan River, all they need to do is to wear the Israelis down, and they will eventually cave in to all of their demands. What I mean to say is, that the Palestinians have not given up on “GREATER PALESTINE” which means the destruction of the state of Israeli. If one were to ask from the average Arab living in the WB or in Gaza, whether or not they would support Israel’s destruction if the opportunity presented itself, the results would be a resounding, overwhelming majority. There is no interest in building a proper foundation for any eventual peace and co-existence with Israel, inside the Palestinian camp, either in the WB or in Gaza. That’s the truth,, no matter how unconvenient it may be. Srdja Trifkovic has his own insights in an article on Olmert’s recent admissions, and it’s worth the read. Exactly Srdja, what external gauarantees? Previous Post Previous Post Finnish Politician: We Need to Make More Babies in Finland……. Next Post Next Post Atlas Interviews Lars Hedegaard on Europe’s Future…….